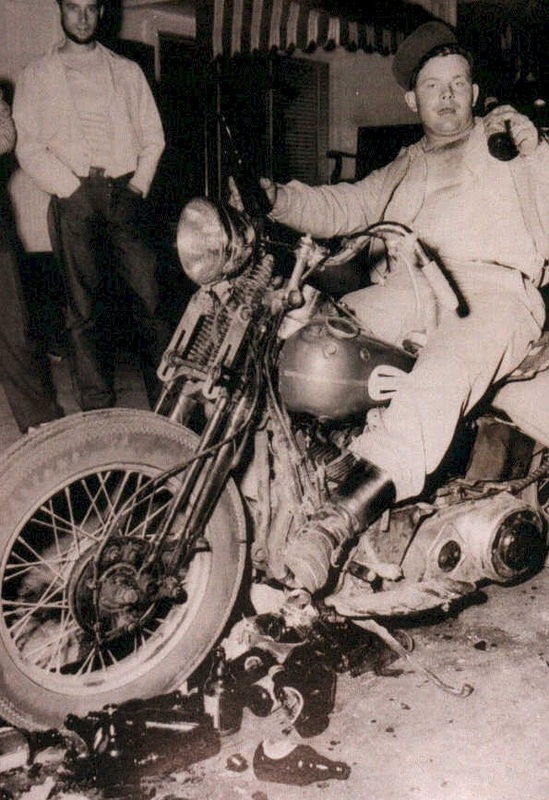 Hunter S. Thompson saw motorcycling as essentially Thanatotic, a kind of mechanical danse macabre, in which the image of the skull had become so ubiquitous as to almost lose its meaning. Thompson rode, and spectacularly crashed, a BSA 650cc Lightening, or ‘A65,’ a British parallel twin much loved by rockers and ton-up boys for its speed and power. (I have the earlier, pre-unit version, the ‘A10.’) His breakthrough book Hells Angels (1966) is still so heavily leaned upon by biker scholars that it remains the definitive work. 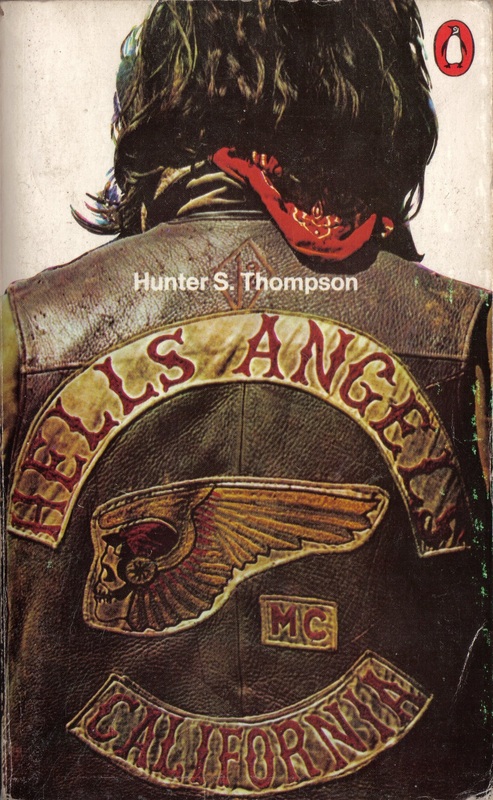 Like the best of Thompson’s writing, the book has a philosophical dimension, with Hells Angels offering a darker, more romantic alternative to the classicism of Robert Pirsig’s bestselling Zen and the Art of Motorcycle Maintenance (1974), like a foreshadowing gothic double. There is no honest way to explain it because the only people who really know where it is are the ones who have gone over. The others – the living – are those who pushed their control as far as they felt they could handle it, and then pulled back, or slowed down, or did whatever they had to when it came time to choose between Now and Later (Thompson: 1967, 281 – 282). The skull in this context makes perfect sense, a metaphysical statement that takes you places Pirsig certainly didn’t want to go, elegant in its semiotic simplicity. It’s not a threat so much as a defiant memento mori. Bikes can kill you. Part of the thrill of the burn is survival, not life affirming so much as death affirming. Like the Ghost Rider – a Faustian chop-opera in which the half-demon hero’s head is a flaming skull – every mile we ride takes us a little bit closer to hell (1). This potentially suicidal aspect of motorcycling is ever present; it’s in the appalling accident statistics, the blind spot of every car driver, and the temptation to still overtake everything on the road as if you’re playing a computer game. It is also the foundation of a much broader cultural code, an Oroboros of influences from fact and fiction that collectively construct an image of motorcycling which both initiated and uninitiated alike believe, a world of dangerous machines and equally dangerous riders. Connotatively, whether they want to be or not, bikers are traditionally viewed as culturally subversive, like the original gothic anti-novels that resisted Enlightenment reason in favour of something darker, ancient and barbarous. Like the eighteenth century Romantics, they are just as likely to identify with Milton’s Satan as they are the cold philosophy of Robert Pirsig. Precise engineering is all very well, but there is also the revolt into style. When Adam Roarke paraphrased Paradise Lost in Hells Angels on Wheels in 1967 – ‘Better to reign in Hell than serve in Heaven’ (Milton, Book I, 264) – the connection with the fallen had in fact already been established for decades (2). This had happened twenty years before the cultural revolution of the 1960s with which we associate Thompson, long hair, free love, civil unrest, acid and Easy Rider, in a complex cultural narrative that had begun with a single, startling image. Motorcycles have been around as long as automobiles, but they had really taken off as working class transport after the Second World War when thousands of British and American bikes were sold off cheap as army surplus. These were often purchased by young men still traumatised by war yet addicted to the excitement and danger. As Thompson wrote, ‘like the drifters who rode west after Appomattox, there were thousands of veterans in 1945 who flatly rejected the idea of going back to their pre-war patterns. They didn’t want order, but privacy – and time to figure things out’ (Thompson: 1967, 67) (3). This diaspora tends not to get much coverage in American history, which as a rule chooses to focus on the post-war economic boom and attendant Cold War politics. Hollywood picked up and dropped the subject relatively quickly with movies such as William Wyler’s The Best Years of Our Lives (1946) and Marlon Brando’s first starring role, as a paraplegic D-Day Veteran, in Fred Zinnerman’s The Men (1950). Kathryn Bigelow also captured this floating demographic in her hyper-real debut movie The Loveless in 1982, in which the bikers hover culturally between 40s vets and early-50s juvenile delinquents, but by this point as simulacra only. There were actors in Wyler and Zinnermann’s movies who had fought in World War II, and bore the internal and external scars to prove it. The motorcycle journalist Mike Seate has described this period as ‘one of the great under-reported social crises of the century’ (Seate: 2000, 10). Used to belonging in tight, homosocial packs, many of these young men traded in their rifles for big Harleys and Indians and went tearing off around the west coast, which was made for motorcycling. Taking their lead from wartime military nomenclature (as the Hells Angels later would) they named their gangs in the manner of air force squadrons, and motorcycle clubs like ‘The Top Hatters,’ ‘The Winos,’ ‘The Market Street Commandos,’ ‘The Galloping Ghosts,’ ‘Satan’s Sinners,’ ‘The POBOBS’ (‘Pissed Off Bastards of Bloomington’), and ‘The Booze Fighters’ began to swarm, holding huge, American Motorcycle Association approved ‘Gypsy Tours,’ the forerunner of the contemporary motorcycle rally, hill climb and race meet. One of these events, fully supported and partially sponsored by the local Veterans’ Memorial Park Association and the Salinas Ramblers Motorcycle Club, was held at the sleepy Californian town of Hollister over the Fourth of July weekend of 1947. The POBOBS and the Booze Fighters roared in, got a bit worse for the drink and there were a few arrests and a couple of accidents. Then the press arrived and ‘The Wild Ones’ were officially born into the discourse of subversion. The name of Hollister was about to enter the lexicon of motorcycling mythology forever as bikers, according to C.J. Dourghty’s report for the San Francisco Chronicle, ‘took over the town’ (qtd. in Veno: 2007, 28) (4). The piece was accompanied by an alarming photograph of a fat figure astride a bobbed Harley 74 parked in an ocean of empty beer bottles outside Johnny’s Bar and Grille on San Benito Street, a brew in each hand, leering horribly into the lens of Barney Peterson, photographer for the Chronicle (5). Over the weekend, the seven man Hollister PD had to deal with between 2,000 (say the surviving riders) and 4,000 (say the surviving policemen) unruly and very drunk scoot jockeys brawling with each other, harassing local women, staging impromptu drag races up and down a main street jagged with broken bottles, and stomping any citizen foolish enough to stand against them. It obviously wasn’t pretty by local standards, and eventually the Highway Patrol had to be bought in to restore order, which they did. The severity of the Hollister event remains open to conjecture to this day, as does the identity of the biker in Barney Peterson’s iconic photograph, whose name is speculated upon yet not known, and may well not have owned the bike in question. Or any bike. But the reality doesn’t matter, any more than whether or not Joe Rosenthal staged the flag raising at Mount Suribachi. The only thing that matters is the function of the image. As the journalist Maxwell Scott famously remarks in The Man Who Shot Liberty Valence, ‘When the legend becomes fact, print the legend’ (6). Peterson’s portrait of the unknown rider created the image of the ‘outlaw’ biker virtually overnight – not, ironically in the Chronicle, whose editors didn’t run either picture or accompanying copy, but in Life, where it appeared on July 21. Middle America looked on in horror. Richard Brooks’ Blackboard Jungle, James Dean’s East of Eden and Elvis’ ‘Don’t be Cruel’ were still almost a decade away. This was without precedent. The American Motorcycle Association issued a fast press release stating that ‘99% of American Motorcyclists were respectable, well-behaved citizens’ (qtd. in Osgerby: 2005, 31). The so-called ‘outlaws’ started proudly wearing patches bearing the sign ‘1%,’ a tradition that continues to this day. These, then, were the new barbarians. After the moral panic surrounding Hollister, popular culture was quick to respond. The most influential piece of Hollister fiction is undoubtedly the short story ‘The Cyclists’ Raid’ by Frank Rooney, which was published in Harper’s Magazine in January 1951. With an added dash of Romeo and Juliet, this became the basis for John Paxton’s screenplay for The Wild One, directed by László Benedek in 1953 and starring Marlon Brando and Lee Marvin, both destined to become poster boys for rebellion, with Brando’s performance inspiring James Dean, Elvis and Gene Vincent to get motorcycles. In common with many of his generation, Frank Rooney was a World War II veteran. He was essentially a pulp writer and little is known of his life or work beyond ‘The Cyclists’ Raid.’ The premise of the story leans heavily on the post-Hollister press, and is written in a hybrid style that at once blends the hard-boiled with western, gothic, and even science fiction signifiers, a common trait in pulp writers who would often tell the same story in different genres with minimal alteration to make deadlines. The story is ostensibly a simple one, reminiscent of a western in which a frontier town is raided by a gang of unruly ranch hands: some motorcyclists ride into a quiet town in large numbers; they achieve uneasy local acceptance by flashing their cash, then get drunk and increasingly disorderly, in an escalating confrontation that inevitably leads to tragedy. The through line of The Wild One is already apparent. ‘The Cyclists’ Raid’ is told from the point of view of a middle-aged Second World War veteran, Lieutenant Colonel Joel Bleeker (retired), a hotelier in a small unnamed Californian town. Through his eyes, the Hollister event becomes a sinister and morally ambivalent tragedy of masculinity, self-loathing, murder and revenge; his name, itself, a prophetic and controlling metaphor for the tone of the story and the future it prefaces, bleaker. The story begins with a connection between motorcycles and impending catastrophe, while the visual imagery is immediately marshal: the ‘long stern column of red motorcycles coming from the south’ sound to Bleeker like a low flying aircraft he imagines is going to strike his hotel. (Rooney: 1951, 38 – 39). In effect it does, in the form of the ridiculously camp 40-odd strong Angeleno Motorcycle Club, a group so into military conformity that they all ride identical bikes and dress in identical khaki. The only exception is the leader, Gar Simpson, whose ride is white rather than red, like Napoleon upon his white stallion, Marengo. They are an almost insect collective who never remove their green-tinted goggles, giving them ‘the appearance of some tropical tribe with enormous semi-precious eyes, lidless and immovable.’ So alien are they, in fact, that the fiancé of Bleeker’s daughter, Cathy, jokes nervously that they look as if they come from Mars, a familiar science fiction analogue of the Soviet threat to America (Rooney: 1951, 41). Simpson explains to Bleeker that this spookily disciplined and conformist column ‘expect to bivouac outside your town tonight’ (Rooney: 1951, 40). He is proud of his boys, who are, he tells Bleeker, ‘The youth of America. Our hope for the future’ (Rooney: 1951, 42). This is the evangelic language of political extremism, from Nazi to People’s Soviet, and Simpson’s sense of self and collective assurance is disturbing. To Cathy, they are ‘little tin soldiers out on a spree,’ while Bleeker sees ‘a private army,’ and he and Simpson take an immediate dislike to each other (Rooney: 1951, 43, 45). Bleeker’s experience is more accurate than his daughter’s innocence, and an air of pure menace accompanies the Angelenos as they split into smaller groups and gradually take over the local bars, ‘moving with a strange coordinated fluency that was both casual and military’ (Rooney: 1951, 43). They never remove their shades. Bleeker tells Cathy to go to her room. Recalling the threatening cacophony of the opening scene, the drunken Angelenos then begin to sing like Stormtroopers belting out ‘Erika,’ drowning out all other sounds with their ‘harsh pounding voices’ (Rooney: 1951, 46). In the center of this deafening cyclone, Bleeker feels drawn to a solitary young man drinking Coke, the only member of the gang to remove his goggles. ‘They’re looking for women’ he explains to Bleeker miserably. He doesn’t approve, and his virginal, boyish sensitivity ambivalently moves Bleeker: ‘It was an emotion too rawly infantile to be seen without being hurt by it and he felt both pity and contempt for a man who would allow himself to display such a feeling – without any provocation – so nakedly to a stranger.’ Bleeker understands the boy’s predicament; ‘He didn’t belong’ (Rooney: 1951, 47). Leaving the boy to the mass of those who do, apparently, belong, Bleeker walks into the main street and is disturbed by ‘the sound of automatic firing’ (Rooney: 1951, 48). It is, of course, a motorcycle firing up and dragging down Main Street, the drunken rider losing it and vomiting into the gutter. Then the other bikes start and the monster is loose. The Angelenos start to ride, and not just on the street but the sidewalk and the foyers of the buildings, while Simpson looks on, astride his white Harley, under a hanging lamp. With some difficulty, Bleeker suppresses the instinct to kill him. Inside his hotel, drunken bikers wander the upper floors searching for women, although they are easily guided out by Bleeker, who notices that their arms are unresisting, ‘even flaccid,’ in his grip (Rooney: 1951, 49), as if away from the talisman of their bikes the Angelenos lose their potency, their phallic power. Simpson partially placates the townspeople by contemptuously paying for the damages, fully aware that the one-man Police Department is helpless as the crisis escalates. It is obvious that he holds the town. Campbell’s mouth dropped and Bleeker, turning his head, saw the two motorcycles coming through the lobby doors. They circled leisurely around for a moment and then one of them shot suddenly toward them, the goggled rider looming enormously above the wide handlebars … He saw – and of course Cathy saw – the motorcycle speeding toward her … She did take a slight backward step and raise her arms in a pathetic warding gesture toward the inhuman figure on the motorcycle …. but neither could have changed the course of their actions. She lay finally across the lower steps, her body clinging to and equally arching away from the base of the newel post. And there was the sudden, shocking exposure of her flesh, the robe and the gown torn away from the leg as if pushed aside by the blood welling from her thigh … and someone – not Cathy – was screaming (Rooney: 1951, 52 – 53). The language is clearly that of sexual violence. Extending the horror, Cathy does not die well, taking several hours to finally expire as a result of her injuries. Because of the uniform and goggles, no-one can identify her killer, and the Angelenos simply ride away, pursued ineffectually by the State Troopers. He wanted to scream his agony into the night with no more restraint than that of an animal seeing his guts beneath him on the ground. He wanted to smash something – anything – glass, wood, stone – his own body’ (Rooney: 1951, 55). The local men join in with what becomes a kind of collective blood rite. Bleeker feels his ‘fists going into the boy’s flesh’ and is suddenly gripped with an urge to protect him, shielding the kicks of the townspeople with his own body (Rooney: 1951, 56). He saves the boy’s life, just, and ‘The Cyclists’ Raid’ concludes with Bleeker reflecting that ‘There would always be time to make his peace with the dead,’ but ‘There was little if any time to make his peace with the living’ (Rooney: 1951, 56). 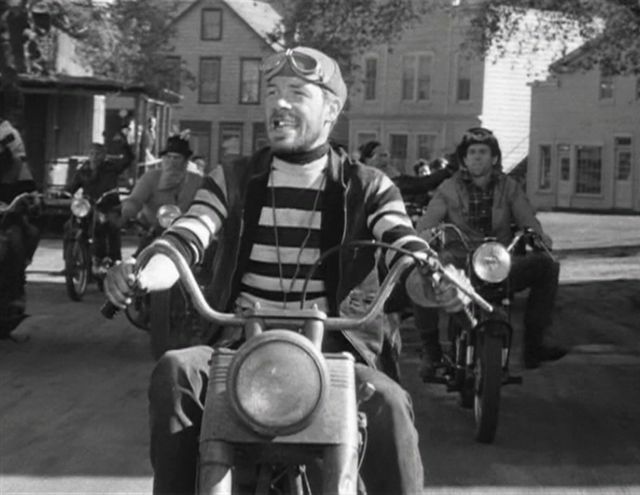 In terms of boundaries crossed and morals transgressed, the subsequent movie, The Wild One, doesn’t even come close to ‘The Cyclists’ Raid,’ except, perhaps, for Chino’s revolutionary call to ‘Raise the Bastille!’ (On his lived-in Harley, Marvin’s character is also much closer to the real deal than either Johnny, clean cut on an immaculate imported Triumph, or Rooney’s Commie Commandos.) Other than this, the film distances itself from the paramilitary aspect of the Angelenos in favour of the more random rebellion of the Black Rebels Motorcycle Club. ‘What are you rebelling against? Kathie Bleeker (Mary Murphy) famously asks Brando’s character, Johnny, a much more sympathetic leader than Simpson. ‘What’ve you got?’ he replies (7). The film was still, however, considered to be so potentially explosive in the UK that the British Board of Film Classification did not grant The Wild One a certificate until 1968, by which point it was just an interesting historical document, culturally irrelevant and about as subversive as George Formby’s Isle of Man TT movie, No Limit (1935). By then, Easy Rider was coming. The Wild One also offers a closure that ‘The Cyclists’ Raid’ does not. Johnny is cleared of murder after an assault by enraged townspeople leads to a fatal motorcycle crash and the death of a local man. Bleeker’s daughter survives unscathed, and the rebel and the girl next door manage to inarticulately connect before the gang leaves town, older and a little bit wiser. Only Chino, essentially Tybalt to Johnny’s Romeo, is busted. ‘The Cyclists’ Raid’ emphatically resists such a tidy third act. The Angelenos are still running, Cathy is still dead, and Bleeker’s final, Nietzschean vision is unlikely to reassure the parents of America. The abyss gazes back. Johnny Blaze, the ‘Ghost Rider,’ is a character from the Marvel Universe created in 1972 by the writers Roy Thomas and Gary Friedrich and the artist Mike Ploog. Originally a carnival stunt rider, he is a Faustian figure forced to punish evil at the behest of a Mephistophelian devil, transforming into a flaming, leather-clad skeleton on a motorcycle, a kind of semiotic collision between rider and regalia. The character has been played by Nicholas Cage in two movies: Ghost Rider (Mark Steven Johnson, dir. Columbia, 2007, US), and Ghost Rider: Spirit of Vengeance (Mark Neveldine and Brian Taylor, dirs. Columbia, 2012, US), riding a custom Harley in the first movie and a more practical Yamaha V-Max in the second. 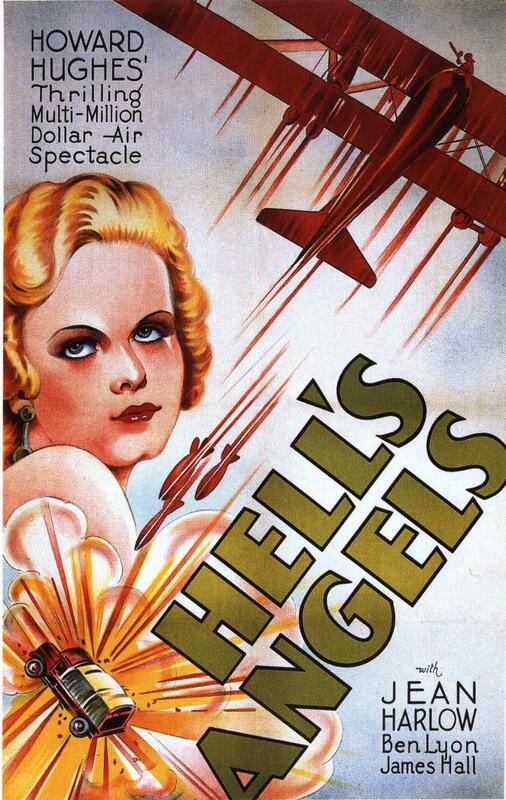 Hells Angels on Wheels (Richard Rush dir; Adam Roarke, Jack Nicholson, Sabrina Scharf, US Films Inc, US 1967). The Battle of Appomattox Courthouse (April 9, 1865) was the last engagement of the American Civil War before the Confederate Surrender. C.J. Dourghty, ‘Motorcyclists Take Over Town, Many Injured,’ filed with the San Francisco Chronicle July 6, 1947. A ‘bobbed’ motorcycle has been ‘chopped’ down from factory standards to its most basic essence: it has no front mudguard, a shortened or ‘bobbed’ rear mudguard, a rigid frame (no rear suspension), a solo saddle, and pre-war ‘springer’ (non-telescopic) front suspension. ‘74’ refers to the capacity of the V-twin engine in cubic inches. This is 1200ccs in the new money, and was the preferred hog of all outlaw US motorcyclists. The Man Who Shot Liberty Valence (John Ford dir; John Wayne, James Stewart, Lee Marvin, Paramount, US 1962). 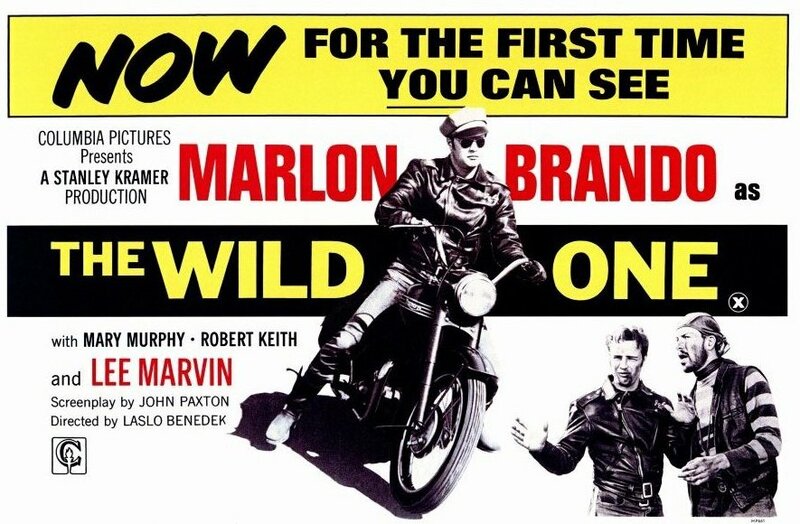 The Wild One (László Benedek dir; Marlon Brando, Mary Murphy, Robert Keith, Columbia, US 1953). Mills, Pat, and O’Neill, Kevin. (2003). Marshal Law: Blood, Sweat and Fears. London: Titan. Milton, John. (1997). Paradise Lost. (Alastair Fowler ed). 2nd ed. London: Longman. (Original work published 1667). Osgerby, Bill. (2005). Biker: Truth and Myth. London: Ivy Press. Rooney, Frank. (1951). ‘The Cyclists’ Raid.’ In Veno, Arthur (ed). Bikers. London: Constable & Robinson, 2007. Seate, Mike. (2000). 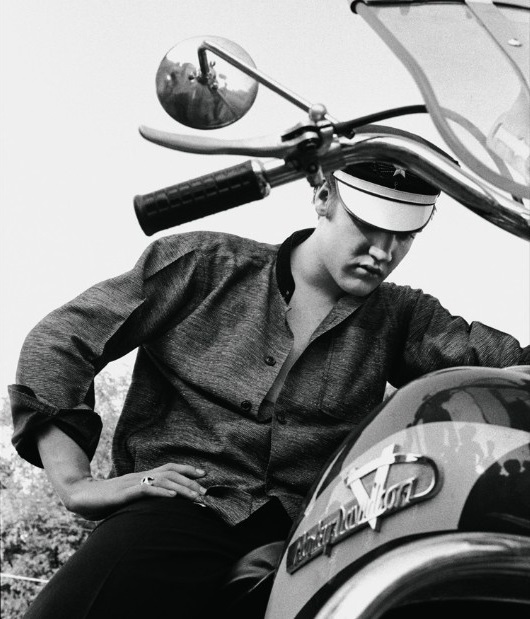 Two Wheels on Two Reels: A History of Biker Movies. New Hampshire: Whitehorse. Thompson, Hunter S. (1967). Hells Angels London: Penguin. (Original work published 1966).